Rabbi Stuart Fischman graduated from Yeshiva University in 1980 and the dental school of Columbia University in 1985. Since 1989 he has been studying and teaching at Yeshivat Hamivtar in Efrat. He has rabbinic ordination from Rav Zalman Nechemia Goldberg. Shabbat begins with the lighting of candles and ends with lighting a candle during the Havdalah ceremony. Havdalah may seem like a simple task but there are many questions and unique situations that may arise. First of all, if Shabbat ends with three visible stars in the sky on a Saturday night, why do we even need to do Havdalah? What's the latest one can recite Havdalah? Why do we use spices and make the blessing over wine? Through the halachot from the Gemara down to contemporary poskim we will journey through the issues at hand, the reasons behind the customs, and why making such a statement of separation between Shabbat and the week is so essential. Twice on Shabbat a Jew makes kiddush: once in the evening after Shabbat begins and a second time on Shabbat morning. Does each have a different purpose? Can Kiddush be made over anything other than wine? Who is obligated in Kiddush and can it be said in a different language? Kiddush is not something to be taken lightly. In this course we will explore the foundations of Kiddush and the halachot from the Gemara down through contemporary poskim. The idea of serving Hashem (Avodah) through the physical is important in Chasidic thought. Prior to the Chasidic perspective, material necessities were looked at as simply the necessities which enable us to live and then do Mitzvot. In this course we will look at some of the greatest Chasidic masters to understand the idea of serving Hashem through the physical and mundane by having the proper intentions. Chasidut is perhaps the only movement which set out to change the Jewish people's ideas about Judaism that succeeded in doing so while remaining loyal to the observance of Torah and mitzvot. The great change of Chasidut is that it asked us to be aware of our relationship to God. The relationship of the individual to God is Emunah. What does Emunah mean? is it a feeling? is it belief? is it knowledge? All of these possible definitions have validity. We will explore what the various Chasidic teachers taught regarding what is probably the most important question that a Jew needs to answer; where is Hashem in my life? In this class we will discuss the practical halachot of the Sefirat HaOmer. In the 7 weeks between Pesach and Shavuot, we could the Omer. What exactly is the mitzva? We will also talk about the customs associated with the period of mourning which falls during this time. In this course we will discuss the practical aspects of the laws of Biur Chametz, burning of Chametz. What sorts of chametz need to be disposed of? What may be kept in the house, but locked away? What are the issues involved in selling chametz as opposed to physically removing it from the house? In this shiur we will discuss the Chassidic ideas on Pesach found in the Shem Mishmuel to make the holiday more meaningful. The Shem Mishmuel is a compilation of teachings of Rabbi Shmuel Bornsztain, the second Sochatchover Rebbe, from the early 1900's. In this shiur we will discuss the Chassidic ideas on Pesach found in the Sefat Emet to make the holiday more meaningful. The Sefat Emet was written by Rabbi Yehudah Aryeh Leib Alter, a Gerrer Rebbe in the late 1800's. We will learn the mitzvah of Kiddush Hashem, sanctification of the name of God. Is this a mitzvah which must be sought out and even accepted voluntarily or is it only a mitzvah when there is no way to escape it? This is a fundamental disagreement between the Medieval Poskim (Halachic Authorities). We will review medieval Poskim, as well as Poskim from the Holocaust period to get a better understanding of how Jewish scholars through these periods in various locations viewed this mitzva. Part of keeping a kosher home is keeping meat and milk separate. This course will include a basic overview of the prohibition on cooking meat and milk together, as well as the associated issues of keeping separate dishes for meat and milk and the status of pareve (neither meat nor dairy) foods cooked in pots with the status of meat or dairy. In this course we will study the laws of fasting as well as the prayers of Yom Kippur. The Shem MiShmuel, Rabbi Shmuel Bornsztain, provides ethical, spiritual, and Chassidic insights into the chaggim. In this course we will study the Shem MiShmuel's writings on the chaggim to make our holiday experiences more meaningful. Does Judaism believe in magic? If it exists can one practice it? What are the limits? In this course we will look at the halachot (laws), and we will also broaden the discussion to explore the dichotomy that exists between various Jewish philosophers. We will look at the the adherents of the Rambam who decry the entire subject as nonsense and the adherents of the Ramban who say that it is not nonsense but it an efficacious endeavor which the Torah happens to prohibit. Torah learning on WebYeshiva.org in Spring Semester 2017 is dedicated in the memory of Yehezkel and Sarah Lemel z”l by their loving family. יחזקאל בן אשר למל ושאשא יוכבד ז”ל ושרה מניה פייגע בת יום טוב וטשארנה רבקה ז”ל Click here to learn about their inspiring stories and passion for Torah education and Israel. To find out more about dedication opportunities with WebYeshiva.org please contact office@webyeshiva.org. In this course we will take an in-depth look at Ein Ayah, Rav Kook's commentary on the aggadot (anecdotal texts) of the Talmud. We will focus on the aggadot of Massechet Shabbat to gain a stronger understanding of the lessons one can learn from the stories in the text. Torah learning on WebYeshiva.org in Spring Semester 2017 is dedicated in the memory of Yehezkel and Sarah Lemel z”l by their loving family. יחזקאל בן אשר למל ושאשא יוכבד ז”ל ושרה מניה פייגע בת יום טוב וטשארנה רבקה ז”ל Click here to learn about their inspiring stories and passion for Torah education and Israel. To find out more about dedication opportunities with WebYeshiva.org please contact office@webyeshiva.org. Purim and Pesach are busy holidays, full of excitement, joy, and memories. In this course we'll take a look at some of the detailed laws to better understand these holidays. Join us as we explore and learn the about Purim and Pesach from the perspective of the Shem Mishmuel, Rabbi Shmuel Bornsztain. His work is considered a major work in Hassidic thought. Join us as we explore and learn the weekly Torah portion from the perspective of the Ohr HaChaim, Ḥayyim ben Moshe ibn Attar. Modernity brought a number of questions up in Jewish law, in particular surrounding the use of electricity on Shabbat. How does Jewish law view use of electricity on shabbat? In this course we will look at some of the earlier sources, such as the Chazon Ish zt"l and Rav Shlomo Zalman Auerbach zt"l, as well as some more current poskim including Rav Asher Weiss and Rav Nachum Rabinowitz of Ma'aleh Adumim. The Rosh Hashana and Yom Kippur prayers have a unique structure and very specific layout, designed to enhance our holiday, bring us closer to teshuva (repentance) and closer to God. In this series we will look at the prayers and try to understand them in order to prepare for the upcoming High Holidays. The synagogue is the house of prayer, as well as the center of Jewish life. In this course we will explore the laws concerning etiquette, management, and the construction of the synagogue. A large and growing segment of the Jewish population are eating kitniyot, the group of legumes which originally only Jews from Sephardic countries ate during Pesach. Join this class and learn about how the custom evolved, what it means, and who eats kitniyot today. Eating matza is one of the most well-known mitzvot of the seder and Pesach itself, but there are various kinds of matza and various customs about when to eat them. Join this course to learn all about matza including shmura matza, machine-made matza, the difference between the two, and how halacha deals with technology in making matza. The Purim seuda, or feast, is one of the most important mitzvot of the holiday. Unlike other festive occasions it only begins to take place during the day and not at night. Why is this the case and why is there a seuda in the first place? Who is invited and are there any special foods? Join this class to find out the answers to these questions and more. What is the mitzvah of Parshat Zachor and why is remembering before Purim so important? After all, there is a custom to say this as part of a number of remembrances after the daily morning prayers. Join this class and we will explore this topic through the Gemara, Rambam, Sefer hachinuch, and other sources. We will explore the concept of freedom through the teachings of Rav Shagar. Rav Shimon Gershon Rosenberg zt"l (known to the Israeli public as "Rav Shagar") was a creative Rosh Yeshiva and writer. He combined in his essays classic Hassidic ideas with modern values and arrived at original interpretations of the mitzvot. We will study the ideas of Rav Shagar on the holiday of Purim, and explore what it means to be happy. Rav Shimon Gershon Rosenberg zt"l (known to the Israeli public as "Rav Shagar") was a creative Rosh Yeshiva and writer. He combined in his essays classic Hassidic ideas with modern values and arrived at original interpretations of the mitzvot. In Jewish law we have the concept of "Hashavat Aveida", returning a lost object. To what lengths must one go to find an object's owner and return the lost item? What should one do if the owner cannot be found? Are the rules different for something of greater value? Join Rabbi Dr. Stuart Fischman to discuss these and other fascinating topics regarding lost and found items. Join us as we explore and learn the weekly Torah portion from the perspective of the Shem Mishmuel, Rabbi Shmuel Bornsztain. His work is considered a major work in Hassidic thought. The Torah commands that for seven days we shall dwell in booths and to shake the lulav (palm branch) and etrog (citrus fruit from the "Hadar tree"). What does this mean, what is required of us, and what is the significance of these laws? During this year's Elul z'man we will be learning the מוסר work, שערי תשובה (Gates of Repentance), which was written in the 13th century by Rabeinu Yonah, who lived in Spain. שערי תשובה is not a book which is easy to read. Even more than חובות הלבבות which we studied during the past year (and to which we will return, בלי נדר, during the coming winter) שערי תשובה makes demands on us. Rabbeinu Yonah does not only encourage us to do תשובה. He warns us about the consequences of failure to do תשובה. שערי תשובה is a fixture in yeshivot and is intensively studied by students as they prepare for Rosh Hashanah and Yom Hakippurim. However, I have noticed, that among laypeople, the ba'alei batim, שערי תשובה is not studied. It may be that yeshiva students can relate to the spiritual challenge of Rabbeinu Yonah more readily than people who work in the "outside world." It probably is true that people who have "real jobs" respond more readily to the poetry in אורות התשובה and the concepts in על התשובה than they do to the unsparing language in שערי תשובה. Nevertheless, I think that it is important to learn שערי תשובה during אלול. During the עשרת ימי תשובה the text of the Shmoneh Esrei prayer is changed to reflect the fact that during those days we are on trial before God. If any of us were to be on trial before a human judge wouldn't we prepare ourselves as best we could before our appearance in court? Of course we would. It follows that when we are on trial before Hashem we should prepare ourselves as best we can. I think that the group study of שערי תשובה will help us to better appreciate the opportunity that is תשובה. The Torah commands that on Passover we rid our homes of leavened foods (Chametz) and eat Matza. The prohibition against Chametz is so strong that we are extremely careful to ensure that there is no contamination whatsoever of our Matza. In this class Rabbi Dr. Fischman will explain the development of the custom to eat only Matza guarded from the earliest point in production; the growing of the wheat. Looking for a people's court? Try the Beit Din. Rabbinical courts (Batei Din) have become the object of media attention in an unprecedented manner. They have been attacked as inefficient (at best) or vice-ridden (at worst). Nevertheless they are supposed to serve an important purpose. In this series of shiurim we will will study the principles which guide Rabbinic courts and hopefully we will understand the hows and whys of their operation. In this class we will learn about fasting on Yom Kippur through a meaningful responsa written in the Kovno Ghetto by Rabbi Ephraim Oshry in his book "She'eilot Uteshuvot Mima'amakim" (Questions and Answers from the Depth). Each year around the high holidays synagogues collect membership dues from constituents. How should synagogues asses the amount charged for dues? Are they permitted to refuse partiicipation in Rosh Hashana serves to those who do not pay dues? Can they prevent a non-member from listening to the shofar? The Torah commands that for seven days the Jewish people dwell in huts called "Sukkot". This commandment includes eating in the sukkah. In this class, we will discuss when and under what circumstances one must eat in the sukkah. Who is obligated? What does someone who is traveling or working in an office do? In this course we will learn about employee/employer laws and ethics on issues such as striking, spying on workers, paying wages on time, and more. Jewish law informs all parts of our day to day lives, including how we run our businesses. In this course, we will talk about the laws surrounding commerce. What is considered fraud? How can we ensure we are being as honest and ethical as possible? NEW! Is Your Chicken Kosher? When we check food for the "kosher" label, what are we really looking at? In this course we will learn about what factors go in to determining whether chickens are kosher and why some people might label something as kosher that others would say is not. One of the main components of the mitzvot of Passover is the consumption of Matzah at the Seder. Learn more about what is required and what it all means. 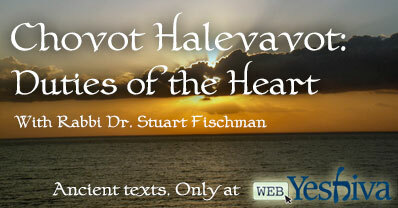 Chovot Halevavot is the oldest systematic book on ethics that we have. It was written By Rabbeinu Bachya in the 11th century. For previous classes please click here. The Torah prohibits the charging of interest. 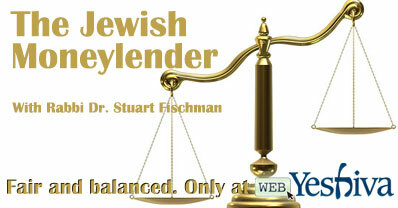 Learn the laws of Jewish moneylending and interest. In this course we will learn about employee/employer laws and ethics on issues such as striking, spying on workers, paying wages on time, and more. Please click here for previous classes. By studying Mesillat Yesharim we will be studying what it means to live as a Jew. Mesillat Yesharim is not only a classic because of its content, but it is one of the few books of Jewish thought that has been embraced by all the streams of Jewish practice, and has been endorsed by the Gaon of Vilna as well as Prof. Yeshayahu Leibowitz whose lectures on Mesillat Yesharim have been published. Judaism includes many special laws about foods cooked or prepared by non-Jews. In this class, we will focus on food cooked by non-Jews (Bishul Akum), bread baked by non-Jews (Pat Akum) and dairy products farmed by non-Jews (Chalav Akum). Rav Eliyahu Dessler zt"l (1892-1953) was one of the most original and profound teachers of Torah in the previous century. He served as mashgiach in the yeshivot of Gateshead in England and Ponovezh in Israel. His shiurim (recorded in the 5-volume work Michtav Me'Eliyahu by his students Rabbis Chaim Friedlander and Aryeh Carmel) cover all the areas which are of interest to the Jewish people. As an heir to the mussar tradition of Lithuania he is driven to bring his audience to a higher level of commitment to to serving Hashem. Rav Shimon Gershon Rosenberg zt"l (known to the Israeli public as "Rav Shagar") was a creative Rosh Yeshiva and writer. He combined in his essays classic Hassidic ideas with modern values and arrived at original interpretations of the mitzvot. We will study three essays of Rav Shagar on the holiday of Pesach. NEW! Are Mezzuzot Lucky Charms? One of the mitzvot which make the Jewish people distinctive is the mitzvah of mezuzah. Even non-Jews know that we put "little boxes" on our front doors. In the popular imagination the mezuzah is viewed as an an amulet or sort of "lucky charm" that Jews put on their doors to keep bad luck away. This is of course a trivialization of the mitzvah. In the course of these shiurim we will study the interpretations given by our sages to this mitzvah as well as the Halachot which govern it. I hope that the shiurim will be both enlightening as well as instructive. In this class, we will discuss the significance of a Jewish judicial system, its rules and powers. What can be inherited (property, positions in the community such as Rabbi)? Who can inherit (sons, daughters)? What allowances are made to leave property to non-relatives and institutions and what enactments have been made to allow daughters a share in their parents' estates? This course will cover the halachot of tekiat shofar; (including the technical points of what sort of sounds need to be heard, the number of sounds, who is obligated to hear the shofar) as well as some of the ideas for explaining the mitzvah of tekiat shofar. In this course we will discuss some aspects of the laws of marriage and divorce, as well as some of the lesser known laws of these two institutions. The Kuzari by Yehuda Halevi is one of the most warmly received and popular medieval Sephardic texts. In the summer zman course at the Web Yeshiva we will discuss the distinctive style of the Kuzari. More importantly we will study the ideas on Judaism presented by Rabbi Yehudah HaLevi and compare them to the ideas of other thinkers. We hope that the course will provide an appreciation of how richly varied the field of Hashkafa truly is. This class is dedicated to a Refuah Shelaima (full recovery) for Stella Frankl, Tzuriya Kochevet Bat Sarah. We will discuss the question of machine-made versus hand-made matzot and how the halacha is decided in this regard. Time permitting, we will also cover the topic of Kitniyot (Legumes). What is the Halachic approach to converting to Judaism? We will start with the Gemara as background and then learn the teshuvot and discuss the various approaches the Rabbis hold with regard to conversion. This class is dedicated to a Refuah Shelaima (full recovery) for Stella Frankl, Tzuriya Kochevet Bat Sarah. Students will learn the Gemara through analysis of various Rishonim (medieval commentaries) and their relationship to the Gemara and the role they play in learning the text. Conceptual issues of the Gemara will be examined including a basic introduction to the role the Achronim (latter commentaries) play in the Halachic system. Questions such as, “Who are the Achronim, what do they do, and who do they comment on?” will be addressed. Are you too busy to learn during the week? Join WebYeshiva.org's Sunday morning program. Specifically geared to those who lack time during the week to attend shiurim, Weekends@WebYeshiva is a way for you to take advantage of Torah learning during your weekend! The program will showcase WebYeshiva's finest teachers and feature different topics every week. You bring the coffee, we'll bring the Torah! This Sunday, December 19th, Rabbi Stuart Fischman will be teaching 'The Mesillat Yesharim on Kedusha'. Students will learn the Gemara through analysis of various Rishonim (medieval commentaries) and their relationship to the Gemara and the role they play in learning the text. Conceptual issues of the Gemara will be examined including a basic introduction to the role the Achronim (latter commentaries) play in the Halachic system. Questions such as, Who are the Achronim, what do they do, and who do they comment on? will be addressed. Students will learn the Gemara through analysis of various Rishonim (medieval commentaries) and their relationship to the Gemara and the role they play in learning the text. Conceptual issues of the Gemara will be examined including a basic introduction to the role the Achronim (latter commentaries) play in the Halachic system. Questions such as, “Who are the Achronim, what do they do, and who do they comment on?” will be addressed. PLEASE NOTE: This class requires a minimum of 10 paying students in order to ensure its continuation this zman. Students will learn the Gemara through analysis of various Rishonim (medieval commentaries) and their relationship to the Gemara and the role they play in learning the text. Conceptual issues of the Gemara will be examined including a basic introduction to the role the Achronim (latter commentaries) play in the Halachic system. Â Questions such as, â€œWho are the Achronim, what do they do, and who do they comment on?â€ will be addressed. Please note that this class requires a minimum of 7 paying students in order to proceed. If this number is not reached, the class may be discontinued. Students will learn the Gemara in English through analysis of various Rishonim (medieval commentaries) and their relationship to the Gemara and the role they play in learning the text. Conceptual issues of the Gemara will be examined including a basic introduction to the role the Achronim (latter commentaries) play in the Halachic system. Questions such as, Who are the Achronim, what do they do, and who do they comment on? will be addressed. This class will be based on Mishna Brurah and various sh'eilot u'tshuvot (responsa). It will cover topics, such as going on a trip during Sukkot when you won't have access to a sukkah, cloth-wall sukkot, etc.